I am not sure this is a view of the inside of a liquid propellant tank, and even if was, not sure if it belongs to a Falcon 9 per se. But there are places for fourteen round objects at the far end, and thirteen of them are present and purple/grape-like. What are they? And what is this liquid propellant tank-like structure we are looking in to? The pattern silvery staple-like features around the interior match the slightly earlier overhead shot with people working inside a stage; I believe from the dimensions the earlier shot is an F9 second stage. This is a longer tank, so a preponderance of evidence says it's the F9 first stage. As Organic Marble surmises, the "grapes" are almost certainly the COPV helium tanks; we know those live in the LOX tank and there's not much else you'd want to tank-in-tank like that. The LOX tank lives above the kerosene tank, and I thought at first the helium tanks should be at the top of that, making this a shot up into the top of the LOX tank. Someone in this this Reddit thread says opposite, though, that the center hole is the LOX feed and the COPVs are at the bottom of the tank so they stay in a consistent LOX-submerged environment throughout the stage burn, which is probably right. Each and every rocket has the option to be fitted with a different COPV configuration. It depends entirely on the mission, so they've flown various configurations over the years. After Amos-6, they didn't really "add more" COPVs as much as they simply eliminated the more "cutting edge" configuration which stuffed as much Helium into as few COPVs as possible. The thread also says the tanks are black with a (translucent?) red liner. 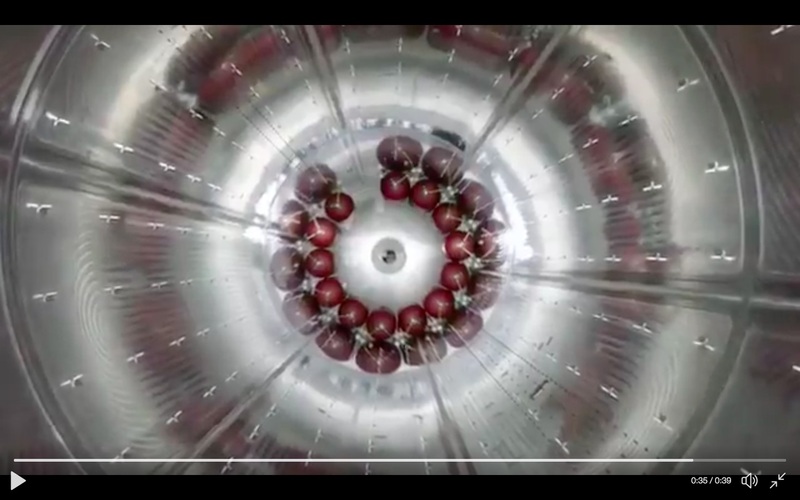 The grapes are Helium storage tanks, called COPV's (Carbon Overwrapped Pressure Vessels). They are immersed in the LOX tank of the first and second stages (for the extra cooling) to make them able to take more pressure than at STP. The AMOS-6 refueling incident and the CRS-7 mission loss were due to COPV's venting. AMOS-6 is thought that the loading order of the Helium caused it to cool more than expected and form solid oxygen around the piping, which then burnt at the slightest touch and the bursting of the COPV burst the stage. The CRS-7 in flight RUD was thought to be a strut holding the COPV failed and it broke off a pipe which vented the pressure into the tank, bursting the LOX tank. Not the answer you're looking for? Browse other questions tagged spacex falcon-9 liquid-fuel identify-this-object or ask your own question. Why is heated Helium used for tank pressurisation in Falcon 1? What is the spherical tank in this drawing of the BFS? What are these tiles inside the Falcon 9 fairing?